Everything You Never Knew about PDO Threads - Doctor Hermann M.D.,P.A. Combating signs of aging and maintaining a vibrant, youthful appearance doesn’t have involve the use of invasive cosmetic procedures. Though facelift surgery may have been one of the only options to lift and tighten skin in the past, we are fortunate to live in a time of rapid cosmetic advancements. PDO threads called Nova Threads are the most recent innovation to transform what is possible in the realm of cosmetic enhancement. If you haven’t considered a PDO thread treatment before now, you certainly will after this! PDO threads are completely revolutionary because they make it possible to reverse wrinkled, deflated, and sagging skin without any type of surgery, nipping, or tucking. Instead, PDO threads are placed strategically under the skin to promote extra collagen production. This new collagen structures itself around the PDO threads to help lift, tighten, or add volume to a specific area of the face. The threads themselves dissolve after about six months, but the new collagen remains in place for up to two years. That equals up to two years of healthier, more youthful skin! 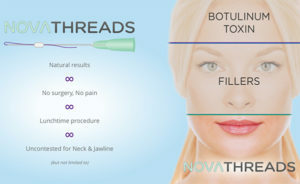 Nova Threads offers three varieties of PDO threads so that you can fully customize your results and create specific changes on different areas of the face. Depending on the type of PDO threads used, you can add three-dimensional lift and volume in the cheeks, minimize nasolabial folds and marionette lines, correct crow’s feet, improve horizontal neck lines, and restore an attractive “v-shape” to your chin and jaw. Thanks to their versatility and simplicity, PDO threads could be the perfect treatment to resolve your most bothersome skin imperfections. If you have mild to moderate wrinkles and folds, volume loss in the cheeks, sagging skin around the jaw and chin, or skin texture concerns, PDO threads can minimize or even reverse your concerns for up to two years. Unlike other cosmetic procedures, you only need to undergo one treatment session to see your results! Ready to give this incredible procedure a try? Call (813) 902-9559 to book a free consultation at Hermann Wellness in Tampa or St. Petersburg, Florida. Just one PDO threads treatment could be all you need to look and feel your best.